Since I have now arrived at the septuagenarian stage of my life, it has for awhile seemed abundantly clear to me that I have experienced about all of life there is to experience. I mean, if you haven’t done something by the time you reach seventy years of age, it probably ain’t going to happen, and dreaming about it will not get it done. Even if the opportunity arose that you could indulge in a new experience, your body has become so creaky, and the mind so mushy that the very attempt to experience something new makes one just want to take a nap. The comfort zone becomes so narrow that any deviation is met with alarm. Let me say before I go any further that during my entire life I have always been considered a masculine sort of guy. Even as a mere youth, I enjoyed playing in dirt, picking on girls, climbing trees, and making obnoxious noises. As I progressed into adulthood, I enjoyed cars, fishing, hunting, sports, and even girls. But I also enjoyed being dirty, greasy, sweaty, and sort of generally unkempt. I mean, dirt under the fingernails or scruffy hair never really bothered me that much. Now that I am the picture of refinement with impeccable speech and decorum, I can proudly say (somewhat secretly) that I haven’t abandoned my roots. I am still distracted by a sporty, stylish car that passes me. I had a boss in the car business who used to describe a good looking car by saying, “It just stands up and says hello to you!” After years of appraising trade-in vehicles for dealerships, to this day when I look at a car, a number always pops into my head as to its value. Girls…i.e. women…are a different kettle of fish. When you’ve got the best, who needs the rest? End of story. However, I still enjoy spending time with the guys as we make remarkably visionary statements about every subject known to man. Lastly, I have always been an active participant in various sports, although at the current time a bum hip is limiting my physical stresses. That last fact I mentioned (hip) has had other consequences. Being a man’s man who considers beauty shops a sort of no-man’s land and a real old time barber shop one of the last bastions of real manhood, I have always been a person who looked with amused disdain upon men who had their hair styled, while with pride I took care of my own hair and trimmed my own nails, both hand and feet. The hip problem, however, has made it difficult for me to even put on my socks, much less to trim my toenails. My wife came to the rescue for me, however, this last Fathers’ Day when she presented me with a gift certificate for a massage and a pedicure. 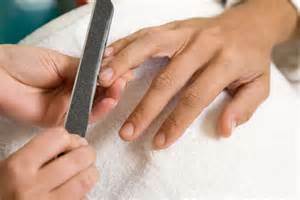 The massage I can take or leave, but the idea of a pedicure made alarm bells go off in my head. To walk into the very heart of enemy territory…especially a guy of my…um…maturity, made me equate this gift as akin to getting a gift certificate for a root canal. I could imagine the outcry of the women as this bull entered their china closet. However, since my wife has shown very limited enthusiasm for helping me with the nail trimming, I decided that I would go to the pedicure shop (whatever you call it), plug in my iPod, keep my head down, and endure the humiliation. Last Thursday, at 10:00 sharp I walked nervously through the doors of Vintage Nails. I was greeted by this fellow, very stylishly coiffured and dressed, with a big beaming smile, who said, “Welcome to Vintage Nails! How can we help?” I asked, “Do you do pedicures for old guys?” To which he laughed and replied, “Of course, one moment, please,” and he disappeared. I nearly bolted for the door. After she had taken care of the nails, she spread some kind of lotion over my feet and legs up to my knees that smelled like oranges, but creamy with like grains of sand in it. She began to massage my feet and calves, and whatever anxieties I had about the session began to fade like the end of a black and white movie. It felt….good. Just so my Friday breakfast buddies will be reminded once more…because they did ask me…I did not yell, “Green light!” at that moment. (Whatever that means…) It was about this time that I made a friend for life. She said something complimentary to me (I forget what) and I replied with “Cam on ban,” which is “thank you” in Vietnamese. God bless Google Translate. You would have thought she had just met her long lost father. In my experiences I have found that in dealing with people whose primary language is not English, learning just a few of their home language words can establish almost instant friendships. The only mistake I made during this whole pedicure/manicure episode was…I told a few people. Well, maybe more than a few, since I posted it on Facebook, so I know that at least my 21 friends are aware of it. But I fear that my manly, masculine, macho image has been damaged forever. I want to set my friends’ fears at rest, however. I may not drive around with a set of horns on the front of my car anymore, or I may have forgotten a few batting averages or names of NFL players. The Rockets or Astros or Texans may not interest me as much as before. I may not go fishing or hunting as much as before. I may not know or care as much about guns or fear Obama as much as you do. I may not talk about my wife in disparaging terms as much as you do (and you know who you are…). BUT I am still a man and am willing and anxious to do man stuff as often as possible. Well...except Thursday mornings….that’s my pedicure time.